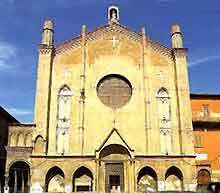 Bologna attraction-guides.com - Bologna, Italy attractions guide Bologna San Giacomo Maggiore (St. James Church) information about attractions, open hours, admission charges, frescoes, art works, Bentivoglio Chapel (Cappella Bentivoglio), Chapel of Santa Cecilia (Cappella di Santa Cecilia), location and address, tel / telephone number, general tourist information about San Giacomo Maggiore (St. James Church) in Bologna area, Italy (Italia) IT - Last updated 30/10/2012. The San Giacomo Maggiore (St. James Church) was built during the 13th century and has been altered over the years. Remaining one of the most important churches in Bologna, the San Giacomo Maggiore (St. James Church) contains many interesting period features, such as numerous frescoes and art work. The Bentivoglio Chapel (Cappella Bentivoglio) and the Chapel of Santa Cecilia (Cappella di Santa Cecilia) are also home to many magnificent treasures and attractions.